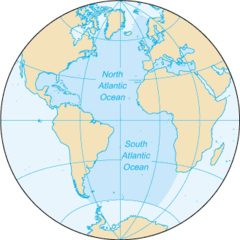 ↑ 2.0 2.1 NOAA: How big is the Atlantic Ocean? ↑ 3.0 3.1 "Atlantic Ocean". Encyclopædia Britannica. Archived from the original on 15 February 2017. สืบค้นเมื่อ 20 December 2016. Winchester, Simon (2010). Atlantic: A Vast Ocean of a Million Stories. HarperCollins UK. ISBN 978-0-00-734137-5. หน้านี้แก้ไขล่าสุดเมื่อวันที่ 16 กรกฎาคม 2561 เวลา 22:02 น.